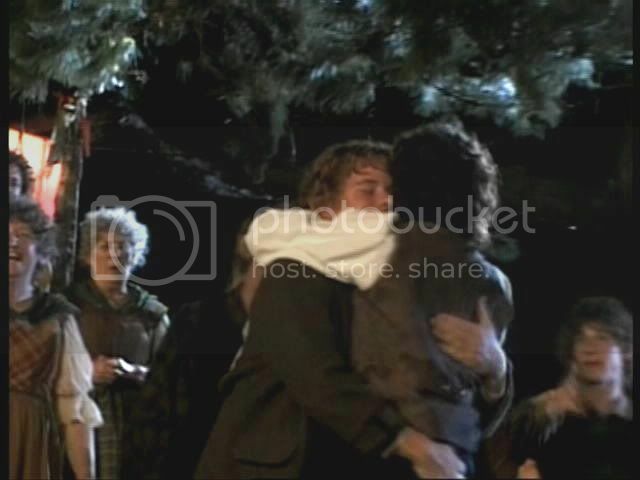 Remarks in my previous entry by Maeglian inspired me to watch the "Frodo leaps into Sam's arms" scene once again. 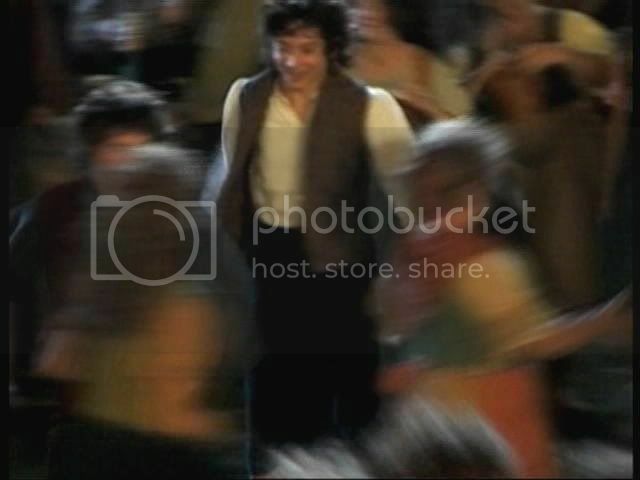 I decided I liked this sequence so much, blurry focus and dim lighting and all, that I would cap it more fully. I just love the youthful exuberance and easy affection that overflows from this scene. I wish there were more of it in the theatrical release. Again, this sequence is from the SCI-FI channel's A Passage to Middle-Earth, a TV special included in the FotR theatrical version DVD Extras. If you really are dying to see it and/or cap it for yourself, it occurs at just past 10 minutes into that special. 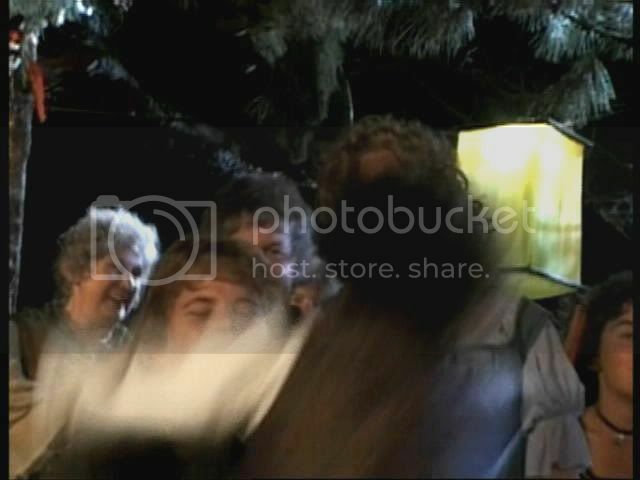 The caps below are from the tail end of the dance sequence that is featured in the Extras. 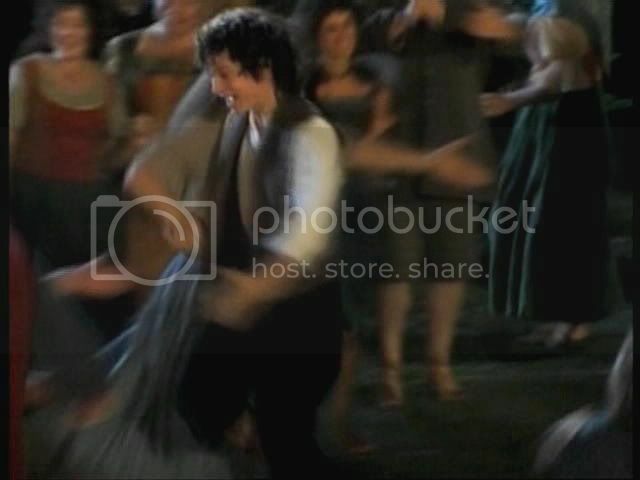 The camera has been following Frodo through the lines of the dance. 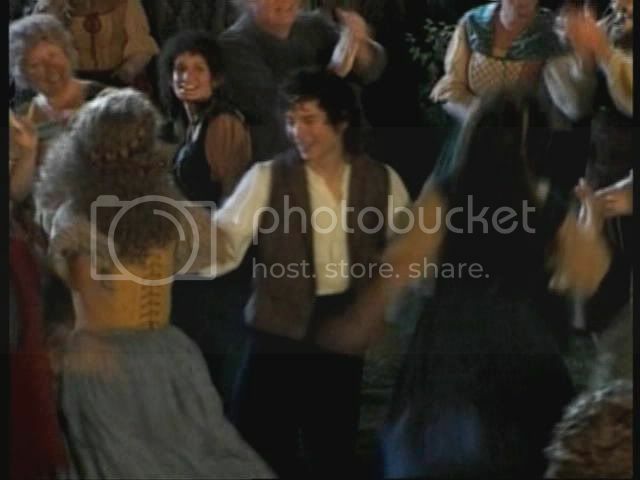 The dancing in this sequence differs from the part that made it into the film, in which Frodo is dancing with a specific partner. Here, he is part of a group. 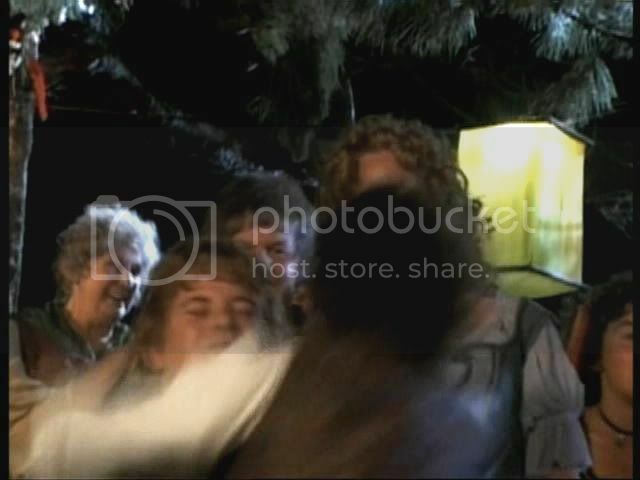 Click HERE for table of Frodo and Elijah Wood Screencaps. 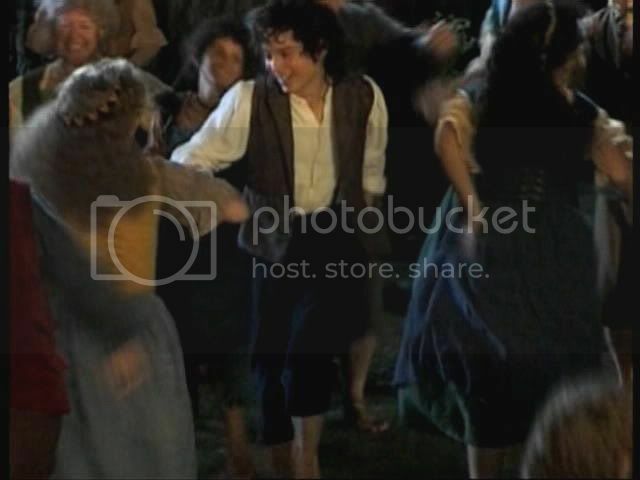 I wanna be one of those hobbit-lasses Frodo's dancing with!!!!!!! Damn! LJ ate my comment. Trying again. Really? All the more reason that they should have included more of it in the film. I remembered that Billy said he was playing guitar in the hobbit band during the scene, but I never saw him doing so in the film. 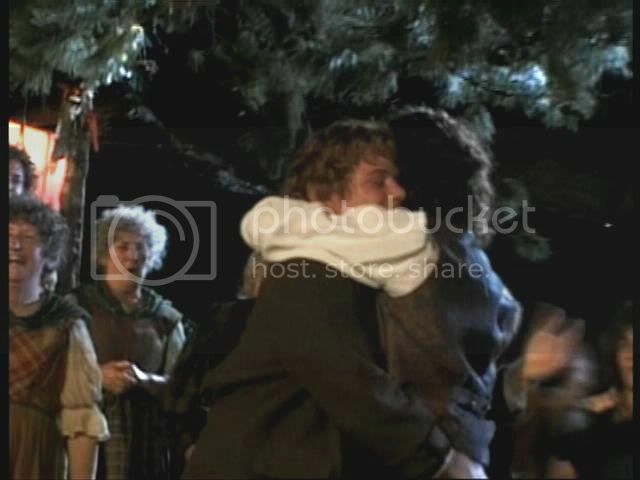 Finally, as I was "pausing" my way through these Extras sequences to make my Frodo caps, I finally saw the frames in which he appeared (in the background). Unfortunately, since I didn't cap them, I can't remember which featurette he was in. And the very last cap - look at the faces of the baffled onlookers: "Hey - we had no idea they were making the film version of LotR into this kind of hobbity slash fest! How come noone told us?" I'm such a ditz - forgetting to log in. :o Above post is mine. 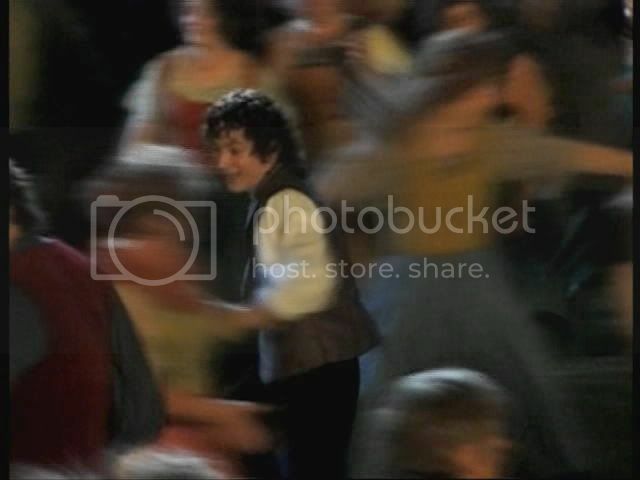 The blurry ones with Frodo as the center point of the dance - such great illustrations of life and motion! 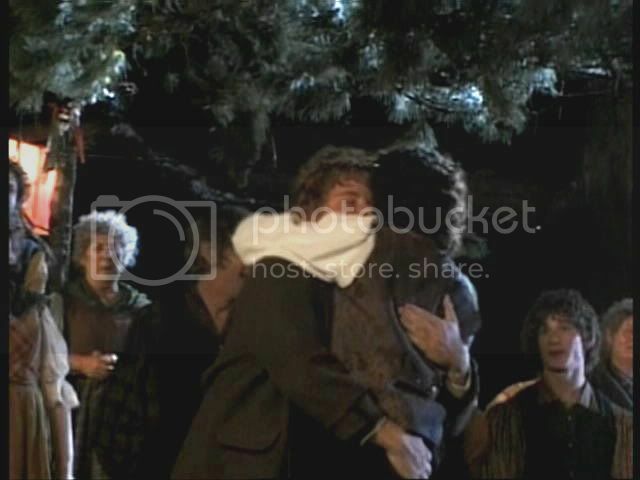 Another hug for you, Maeglian, for making me feel as though it wasn't a TOTAL waste of time to cap this sequence. I liked your take on Rose/Sarah's face in those first frames. When I scrolled back up I thought, "Hey, she's right!" Poor Sarah, if so. What a disappointment! Your last comment cracked me up about the expressions on the spectator's faces. I can just picture those thoughts passing through their minds. Especially the shocked-faced lady. Was it Maewyn who pointed her out? Yep! The look on her face suggests "Well, I never!" Thank you for commenting, frodosweetstuff. If you want to look at the rest of my caps series, the easy way is to hit the tag at the top on the post that says "Frodo screencaps." All of the entries will be called up that way (the ones with screencaps). Even my caps that are of Elijah Wood go under that tag, since I only pore over EW's caps insofar as I think they make good "young Frodo" caps, LOL. *giggles* *coughs* Well, of course he is rather moved and overjoyed, but then again, he knew that Sam would propose sooner or later, so he was more or less prepared emotionally. 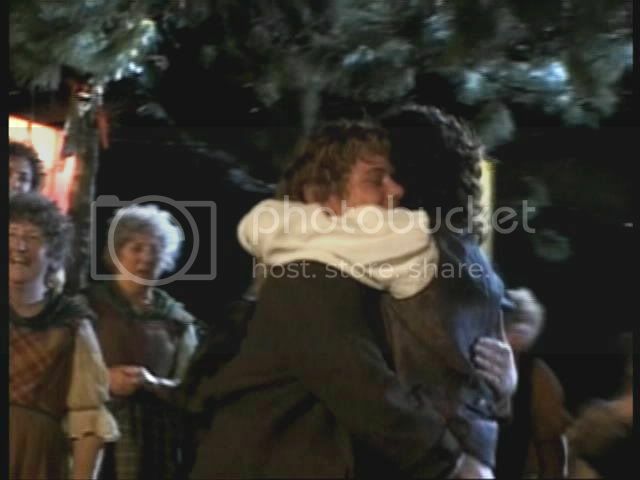 *giggles more* Frodo_naatulien has a matching icon, in which he says "Oh Sam, yes." *ponders this* Yeah, okay. But only if she is already married to one of the Bracegirdle lads. I am so pleased you enjoyed the caps!